Well the cooler weather we have had has been great for the fishing! I ran several trips the last couple weeks and as the weather got cooler the fishing got hotter!! The fish are finally starting to slip into the fall bite! White bass have been on the windy points here the last few days. I’ve been throwing Fle Fly Go Go minnows and doing really well! Trolling has also been a very effective way of picking up some good fish also on the points! Catfish are day by day right now. We need some more cooler weather and they will be on fire. 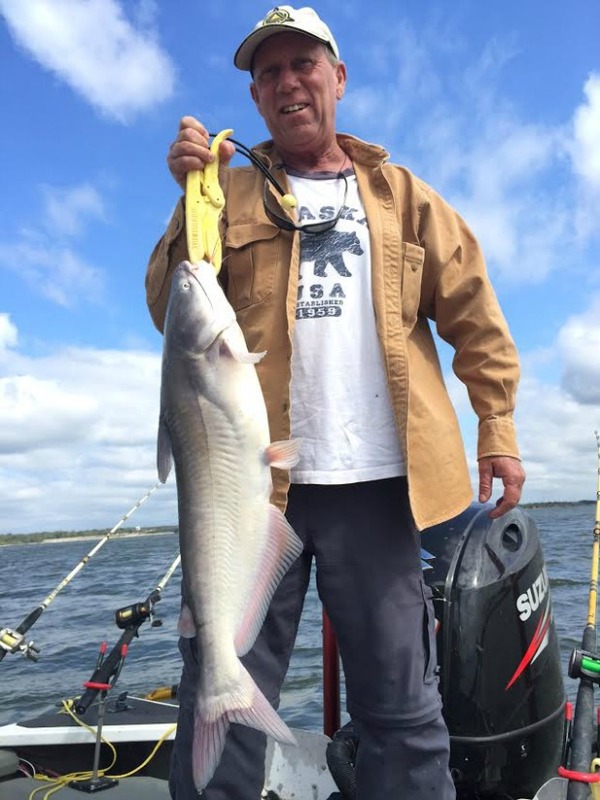 I’ve been drifting 5/0 Team Catfish Double Action hooks on Carolina rigs in 25-35 feet of water on cut bait. Also with a lot of wind get up and anchor out on them windy points – I fish 2-5 feet of water! Crappie are still biting well! I did a video with Jeff Williams last week on crappie. The north wind had just switched and the bite was not as good as it has been but it has picked back up since then and it’s a good time to get out there and give it a try. I’m starting to see quite a few spoonbill starting to stack up in the river channel – it won’t be long before we are back at it again chasing them bills! We boated a little over 1500 spoonbill last season and looking to break that this season! Some of my clients currently hold rod and reel records number 1,2,4, and 5 on Grand Lake right now! Biggest went 110 pounds! If your looking for a guided trip this fall give me a call at (918) 964-0174 and checkout my website at www.rustypritchardoutdoors.com. I also have gift certificates for those hard to by for outdoors men and women!